At Waverley's launch on a misty October morning in 1946, few could have dreamed that she would eventually survive all her peers to become the world's last sea-going paddle steamer. Even in 1974, when bought by the Paddle Steamer Preservation Society for just one Pound (£1) most were grateful she had been saved from the breakers, even if only as a static exhibit. Some enthusiasts with far greater vision, however, recognised Waverley's true potential. Thankfully, their ongoing skills and dedication ensure that the steamer's fine lines continue to be a familiar sight right round the British coastline and even beyond. With a major programme of refurbishment and replating in 2000, Waverley has been largely restored to her original 1940's appearance. 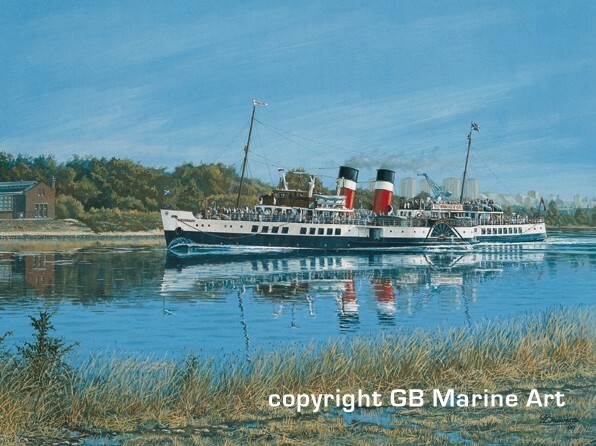 When built, PS Waverley was just one of many vessels powered by triple-expansion, reciprocating steam engines. Today, she is the last sea-going vessel of her class offering the thrilling spectacle of such gleaming, thrusting pistons and immense driving cranks to her passengers. Truly fulfilling that earlier vision, she represents all those qualities which made Clyde-built ships so renowned throughout the maritime world. 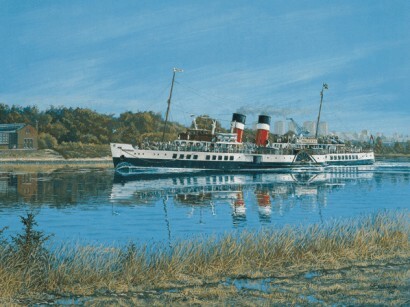 This sparkling portrait of PS Waverley on the tranquil waters of the Clyde near Erskine, bears all the hallmarks by which Gordon Bauwens' maritime paintings have come to be known. The beautiful limited edition prints are particularly appreciated by those who share the artist's love of classic steamers in their environment. Limited edition of 500 individually signed and numbered fine art prints. Note: Ltd Edition sold out. Artist's Proofs available only.